A complete T8 replacement light unit to suit the Regency/Regal 80 aquarium. 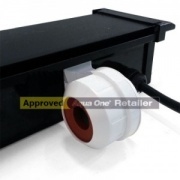 This unit accepts two standard 1” diameter T8 fluorescent tubes and is an original, guaranteed Aqua One light unit. Finished in black. A complete replacement T5 light unit to suit the Regency / Regal 80 aquarium. Supplied complete with 2x 24w T5 fluorescent tubes, mains cable and UK plug. This is an original and fully guaranteed Aqua One light unit. Original Aqua One replacement 24" Marine Blue Fluorescent Lighting Tube.